Yep, that is your Webmeister in the front seat. Besides being a BMW rider for many years (and a computer geek), I have been an aviation enthusiast as well, specifically for World War II warbirds. 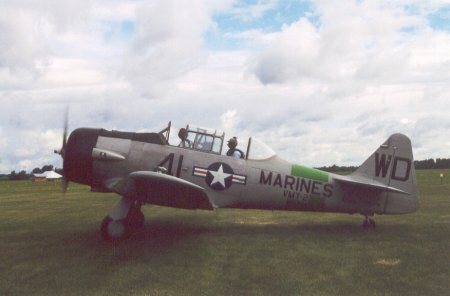 Well, recently for a major birthday, my loving spouse presented me with one of the nicest presents ever — a full hour in this AT-6 Texan 1 (which is actually older than me). The flight included full aerobatics, a video of the entire flight from three cameras, and I had control of the aircraft for almost all of the hour. Number 41 is a 600 horsepower version. It was even more fun than an R1100S on a curvy back road. At 10,000 feet, you can fly upside-down. We did almost all of the BACM (Basic Air Combat Maneuvers), including rolls, loops, Immelmanns, Split-Ses, Cuban-8s, reverse Cuban-8s, snap rolls, and hammerhead stalls. From the seat of your BMW motorcycle, you don't ever want to look UP and see the Earth! Being a non-pilot, I studied beforehand. I was already familiar with what I needed to do - just lacked the experience. There was a time long ago where I really did do some flying. There is only one maneuver I have never done - a landing. If you are interested, read another pilot's description about flying the AT-6. The article contains numerous pictures and may take awhile to load. The U.S. Navy named it the SNJ, and the Brits and Canadians called it a Harvard, but Texan exudes more... macho! Don't you think?